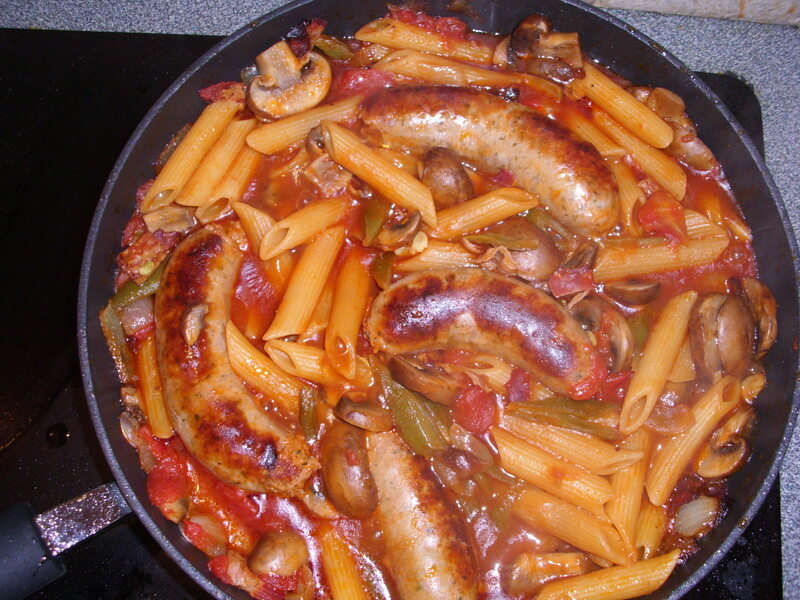 Sausage and pasta – what’s not to love? We love sausages and pasta, so when it is combined in just one pot, easy and quick to cook with hardly any washing up, then this is food heaven. I have to say I was a bit dubious that everything would be properly cooked but I enjoyed every mouthful and all I cook hear from Terry, my husband, was something that I could only describe as a purrrrrrr! Kids will absolutely love this dish, a perfect midweek meal. One word of advise though, use good quality sausages. I think cheaper versions might have too much fat and maybe make the dish oily. The pasta used in this dish is penne so I thought I would look up a few foodie facts. Penne (pronounced peni) is a cylinder shaped pasta. It can be either smooth or ribbed and is designed to hold as much sauce as possible. It was perfect for todays dish and you could actually see the sauce running through the middle of the pasta and oozing out the other end. The name penne comes from penna, Italian for feather or quill, presumably to describe the similar action of these as writing implements. 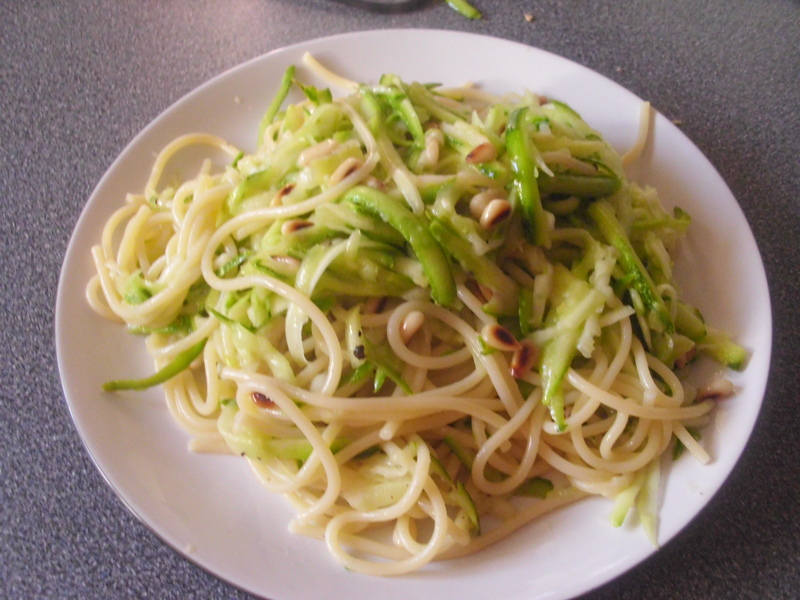 There are some mixed theories of the origins of pasta to Italy. Some say it was brought to Italy by Marco Polo from China. However, there is evidence that pasta was already eaten in Italy during Polo’s time and there is even mention of a type of lasagna in 1AD! In more recent times, the 8th Century to be exact, pasta was introduced to Sicily by the Arabs. It was made from a hard variety of wheat and is believed to be the origin of dried pasta. To this day there are many Sicilian recipes that contain influences from Arabian cooking, and include raisins and spices such as cinnamon. Today there are over 350 shapes of dried pasta and Italians eat over 60 lbs of pasta per person, each year! 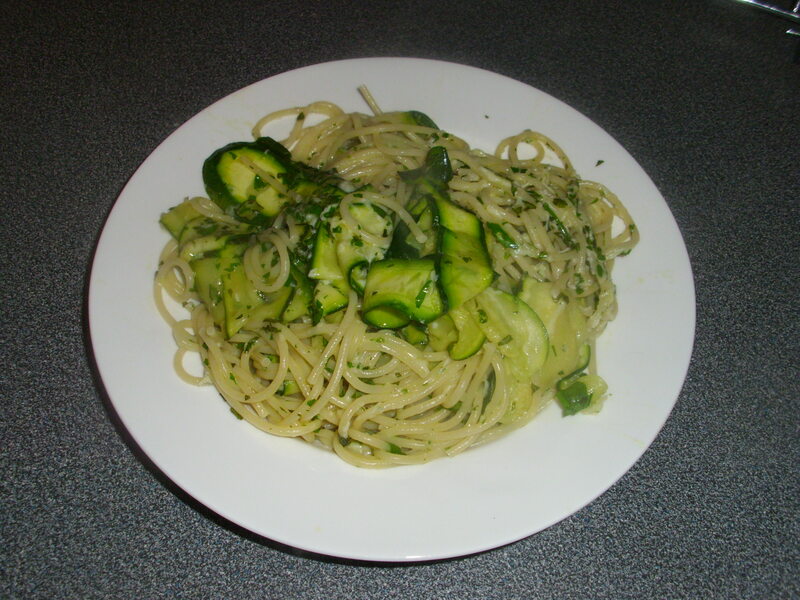 The recipe I am sharing today is based on one from Woman and Home Dinner Tonight. I have adapted it to suit our taste. Hope you enjoy it as much as we did. Heat the oil in a very large, deep, frying pan or saute pan. Fry the sausages, pancetta and onion over a medium heat for about 5 minutes until the sausage is brown all over. Keep turning and moving around the pan to avoid burning. Add the mushrooms and fry for a further 2 minutes until they have softened slightly. Pour in the tomatoes and stock then add the pasta and beans. Mix well, bring to the boil, then simmer for about 30 minutes until the sausages are cooked and the pasta is tender. This should give you a rich sauce. If the sauce is too thick simply add a little more water. If it is too thin boil rapidly for a couple of minutes to thicken it. Stir in the Worcestershire Sauce and season to taste. Serve with a couple of glasses of red wine! Heaven!!!!! 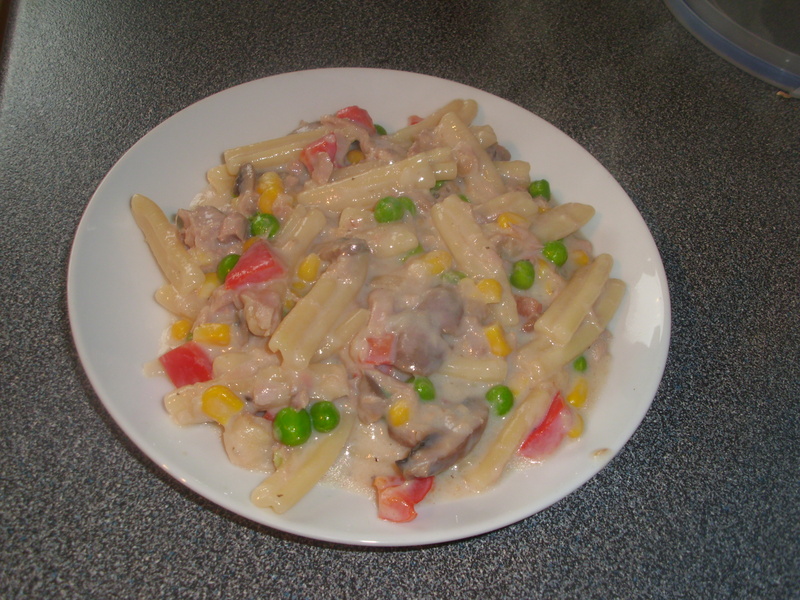 Tuna pasta – my daughter’s favourite. I have been making this pasta dish for at least 35 years. I made it up when the children were small and money was short. I think the first time I ever made it was over the Christmas holiday. In those days the shops would close early on Christmas Eve and not open again until after Boxing Day. Sometimes this meant they were not open for 5 days, as they never opened on a Sunday or a Bank Holiday. Imagine the outcry if that happened today! I remember having to plan my food shopping so we didn’t run out and getting up at the crack of dawn to queue up for the bread. This recipe came out of desperation I think. I had run out of almost everything except for a few store cupboard ingredients and some bits and bobs of vegetables. My kids absolutely loved it and still do to this day. Whenever I ask my daughter what she wants me to cook for her she nearly always asks for Tuna pasta. When I made her some at the weekend I thought I would check to make sure it was on the blog and could not believe it wasn’t there. So, today I will put that right and hope she prints off the recipe so she can continue making it when I am no longer here. Talking about Christmas brings back lots of happy memories. I remember how excited I used to get as a child. I would spend hours looking up into the sky to see if Santa was coming yet. My Mum used to say he would not come until I was asleep. Did she not know how impossible that was! I remember neighbours coming round for a glass of sherry and how happy and warm the house was, filled with wonderful smells. Mum would put the turkey on before she went to bed and cook it overnight, Jamie Oliver would have a fit! I used to share a bedroom with my three little brothers. One Christmas I woke at about two in the morning and found Santa had been. I woke my brother Jeff up and asked him if he wanted me to open his presents. After I had opened them all and eaten his chocolate santa I went back to sleep so I could open mine in the morning. How awful was that! My Mum was furious and made Jeff open my presents for me. Needless to say I never did it again! We used to have lots of Christmas parties in those days. My Dad was a bus driver and Trent Buses had their Christmas Party in a big hotel in Derby. I entered a competition at one of the parties to see who had the most outrageous laugh. I won, which will come as no surprise to those who know me. The prize was a tube of Polos, and I was over the moon! How times have changed. We had some great Christmases when the kids were small too. I remember one year my brother-in-law dropping sweets down the stairs and pretending they had fallen out of Santa’s sack. We never had much money but we always splashed out at Christmas, loads of goodies and a cupboard full of booze. All the neighbours would go to each others houses for a drink in the morning. It’s a wonder I was ever sober enough to make the Christmas dinner. Mind you, one year I did forget to make the gravy! All this reminiscing makes me sad that we have lost some of that community spirit. Next Christmas I am going to make sure I ask the neighbours in for a drink. It’s never too late to improve things. Anyway, enough of the past, here is the recipe. It is one of those that do not have exact quantities. I tend to just guess them by the handful so it will be difficult to be exact. I hope it turns out how it should. My Grandson Hayden has it cold as a pasta salad, so don’t worry if you have left overs. Or you could reheat in the microwave the following day. Cook the pasta in boiling salted water until just tender. Drain well. Meanwhile, heat the oil in a large pan and gently fry the onion and pepper until soft but not coloured, about 5-8 minutes. Add the mushrooms and cook for a couple of minutes more. Add the flour and mix well with the vegetables. Remove from the heat and slowly add the milk, making sure it has absorbed into the flour mix between each addition. Return to the heat and stir until the sauce has thickened. Add the peas, sweetcorn, and pasta and crumble in the tuna in big chunks. Mix well. If it appears to be too thick add a little extra milk. Reheat until all the ingredients are hot. Check for seasoning and, if necessary add a little salt and black pepper. Serve.